Page Street Publishing, 9781624143762, 192pp. If ever there was a cookbook on a particular food from a certain region, most people would associate competition-worthy barbecue from a Southern chef. Chef and caterer Jenn de la Vega is out to change your mind about that. Known on the competition circuit and for her blog, Randwiches, Jenn creates uniquely flavorful and approachable barbecue that belongs at any Smorgasburg. Make eccentric, yet mouth-watering barbecue with or without a smoker, including the specialty side dishes, sauces and pickles that go along with them. This competition cook goes one step further to provide recipes for what to do with the leftovers, too. This book has 100 recipes and 60 photos. Jenn de la Vega is a private chef and caterer, as well as the founder of Randwiches, a curated food blog. 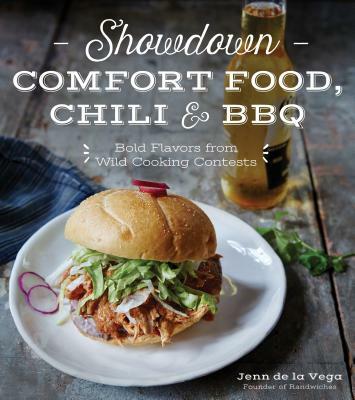 Jenn has participated in many Brooklyn-based food competitions, including the 2014 Brooklyn Chili Takedown and won The 2013 Brooklyn Bacon Takedown and 2012 Project Parlor Summer BBQ Competition. She lives in Brooklyn, NY.